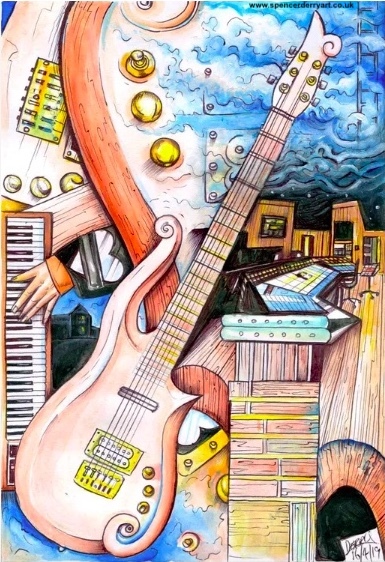 Original hand-drawn and painted art illustration, inspired by Prince's Peach Cloud Guitar, a Moog Keyboard & Paisley Park Studio A. Artwork on A4: 21 x 29.7cm paper (not framed) Media: Ink pen and acrylic. Signed & Dated by UK artist Spencer J. Derry in 2019. Spencer created the official 'Musicology' art illustration on official Paisley Park.